Mine waste, below the Yankee Girl mine on Red Mountain No. 2. The Idarado Mine was a gold mining operation in the San Juan Mountains of Ouray County, Colorado. The mine is within the Sneffels-Red Mountain-Telluride mining district. The remains of the operation are visible from the Million Dollar Highway, north of Red Mountain Pass, between Ouray and Silverton, Colorado. The tunnels of the Idarado extend some 5 miles (8 km) west under 13,000 foot (4,000 m) mountains to the Pandora Mill near Telluride, a trip of more than 60 miles (100 km) by highway. Mindat.org: Minerals of the Idarado Mine — from Mindat.org. 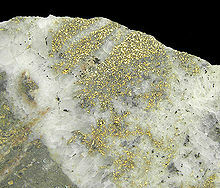 Gold in quartz and sphalerite, detail of historic slabbed ore specimen from the Idarado Mine, collected in 1927. Click on photo and scroll down for other views of this slab. Wikimedia Commons has media related to Idarado Mine, Telluride. This page was last edited on 12 April 2017, at 02:01 (UTC).